Ambrosio Landscape Solutions provides you with a seamless landscape design –build process. We take full responsibility of your property and that begins with the essence of a good landscape design which embraces the homeowner's personality and lifestyle. Whether it's a playground for the kids, a patio and pool for the whole family or an outdoor kitchen and outdoor living area, our landscape architects work with you to bring your vision to life, while realizing the full potential of your property. We begin the landscape design process with a personal consultation at your home to identify the unique features and specific challenges of your property. We will listen and discuss your personal needs, your lifestyle and vision of your property. Then we blend our expertise with your ideas and create a unique master plan for your home that compliments you and your lifestyle. The result of this landscape design process is a thoughtful master plan which will then be estimated by our in-house construction team where an accurate cost analysis will be provided to you. This ensures our clients receive the highest value for their investment and are able to plan, budget and phase the project if necessary. Some of the landscape design services we provide include. As part of our seamless design-build process we take care of all permitting needs and will navigate the cumbersome land-use and zoning approval process. For you, that means a realization of your vision with the ease of working with one company to see it through. Whether serving as lead consultants, or as a team member working alongside attorneys, engineers, architects, soil scientists and other professionals, Ambrosio Landscape Solutions will successfully managed the approval process for you. Ambrosio Landscape Solutions is a true design build firm and the need for construction drawings isn’t always necessary depending on the scope of the work and the experience of our in house construction team. Not only does this help save time but money as well. 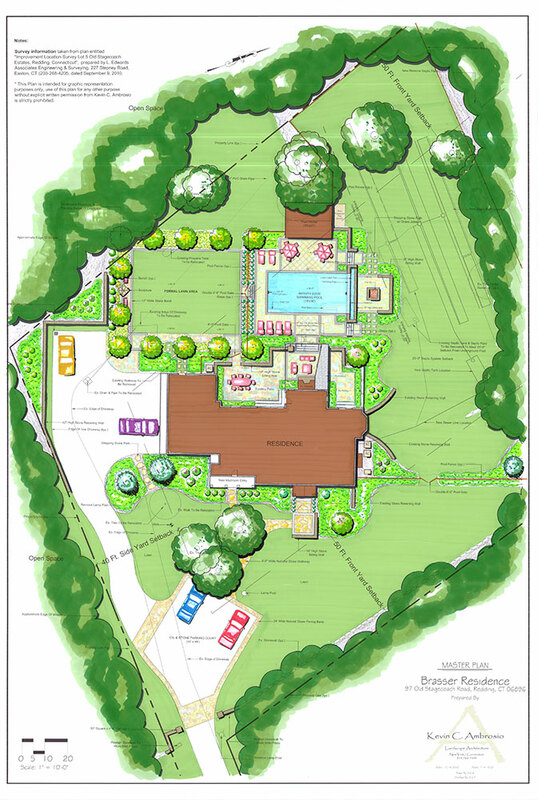 But for those more detailed projects we will need our designers to create detailed drawings for each aspect of the work, such as drainage, grading, layout, planting, lighting and masonry. These working drawings solidify and refine the design, providing material specifications and clarity to everyone and, ultimately, reducing potentially costly field changes during construction. to plan out your project.